I always try to buy what is on sale because I have so many people to cook for and they are all good eaters. Stop and Shop had steak tips on sale so this is what we are having for supper. I am going to give you the amounts I made but please size this down. My portions served ten with leftovers. Four big packages of tips about three to four pounds per package. Marinate at least overnight or more in the refrigerator. Heat the grill and cook on direct heat just to get a sear then indirect heat to finish the cooking. This only takes about 15 to 20 minutes for all this meat. 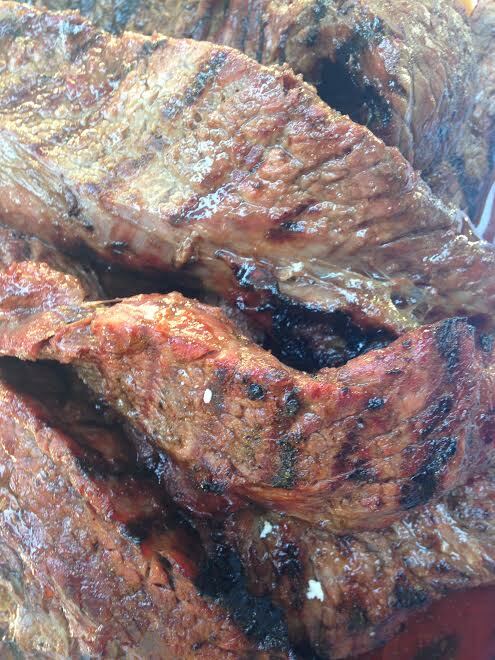 Steak tips can be a little chewy but they have a delicious flavor and the marinade helps tenderize them. The leftovers I sliced thin and made beef and broccoli with the sunbird beef and broccoli mix.